I originally shared this tutorial back in 2011, and it's still a favorite sewing project. The bunting pictured below hangs in the break room at LüSa Organics, and I have another that decorates our camper, Nellie. I also made one for each of the kids for their birthday celebrations. Needless to say, this project is addictively satisfying. Buntings are easy to make and adorable. Done in a single solid fabric (say with white pennants and a pale aqua ribbon) is a classy and fun way to dress up an otherwise serious room. I say sew up a while happy little army of them. We could use more reasons to smile. There are no rules for bunting size, spacing, length, or shape. Use my formula below, or just use it as a jumping off point for your own design. This step is optional, but helpful if you want to know how long your bunting will be. If you don't care, skip the math. If you care, dig in. It'll take you all of two minutes. First, determine how long you want your bunting to be. To do so, measure the area you want the bunting to span. Add two 24” tails if you want to be able to secure the bunting to something. (like a curtain rod or table leg) and 10” for drape. 72” span + 48” tails + 10” drape = 130” length. 120” +48” tails + 10” drape = 178” length. Second, determine the number of pennants or triangles you need. To find this number, subtract your 48” tails, then divide by 10 (the span of each pennant) and multiply by two (the triangles are two sided). 130” – 48” = 82”/10 x 2 = 16.4. Round up to the nearest even number. For the 6’ bunting we’ll make 18 triangles for 9 pennants. 174” – 48” = 126/10 x 2 = 25.2. Rounds up to 26 triangles for 13 pennants. Cut your fabric into strips the height of the triangles (10"). Fold your fabric strip in half matching short edges carefully. Measure in four inches from the raw edge and mark this point on the top edge of the fabric with a fabric pen. Connect this point to the corner on the lower edge of the fabric. Cut off this scrap triangle and discard. In the name of fabric economy you will cut your triangles by alternating point up and point down placement. Measure in 8” on the long side of your fabric and cut. Now measure in 8” on the opposite side and cut. Continue until you have the proper number of triangles, as determined above. With a ½” seam allowance, sew each pair of triangles with right sides together leaving open on the top (short) side. Cut off the point of triangle and turn right-side out. Use a small crochet hook or larger knitting needle to push out the point. Repeat with remaining triangles and set aside. You may choose to skip this step and proceed with grosgrain ribbon or store-bought bias tape. The choice is yours. I have done many variations on the bunting and my favorites used homemade fabric tape (or homemade bias tape). This is also by far the most affordable option. In essence you are cutting a long fabric strip, then folding and pressing the cut edges inside. You might recognize my fabric from the duvet I made for Lupine a couple of years back out of vintage bedsheets. Or you might not. Regardless, it is time to make some bias tape. Cut your fabric into 4” wide strips until you have more than the required length determined above. With right sides together, sew each strip to the next and press open the seams. You will have one very long strip of fabric. Finish the ends by pressing under ¼”, then pressing under ¼” again. Hem. Fold in half lengthwise, wrong sides facing, and press. Open the fabric and bring each raw cut edge in to meet at the center (press line) and press again. Here it will begin to resemble purchased bias tape. Fold one last time along your original lengthwise center fold, and press again. For the free-spirits among us, just wing it. (That is my usual process.) If you prefer to end up with a bit more predictability and precision in your bunting, follow these simple steps. Begin by finding the center of your fabric tape. Open your fabric tape (without unfolding the raw edges) and insert the raw edge of a triangle. If you made an odd number of triangles center your first triangle at this mark and pin into place. If you had an even number of triangles pin ½” to one side of the center mark. Working in both directions from this center point, space triangles 1” apart and pin until you reach the approximate edge of your 24” tail (give or take). If you have a triangle or two left over don’t despair. Perhaps they will make themselves useful in a future project. Begin sewing at one end of your banner. With a ⅓” seam allowance, sew your banner. 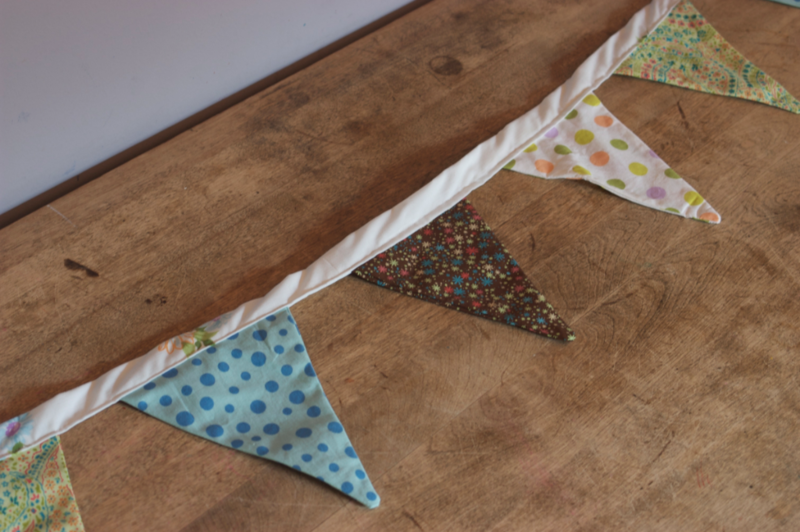 Topstitch along the upper edge of the banner as well and your sweet bunting is complete! You may choose to applique letters onto your bunting (like your child's name or an inspiring word like "play" or "happiness"). If you applique, do so on one side of a triangle allowing adequate space around your work before you sew the backs to the triangles. What a great and useful project! Looks like a good one for beginners and experienced sewers alike. These are super popular right now too so sew away!